02:01 — Hellboy: Film reboot on the way. 04:30 — Hywel Bennett: DEAD! 07:05 — Star Wars: Dr. Princess Leia. 09:59 — Star Wars: Sant undeleted thanks to Rebels. 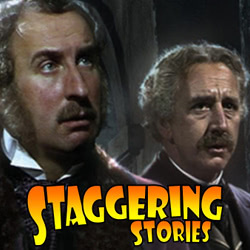 11:58 – Jago and Litefoot, Series Four. 25:35 – Things in Five Words. 33:09 – Doctor Who: Series 10 retrospective. 51:15 – Emails and listener feedback. 51:57 – Farewell for this podcast! Big Finish: Jago and Litefoot (Investigators of Infernal Incidents). This entry was posted on Sunday, August 13th, 2017 at 10:00 and is filed under Doctor Who, podcast, review, Sci-Fi, staggering stories, Staggering Stories Podcast, Staggering Stories Regular Podcast, tv. You can follow any responses to this entry through the RSS 2.0 feed. You can leave a response, or trackback from your own site.